Laurence Obertone wrote a book called France: Clockwork Orange about the disintegration of public order and decency and the innumerable small eruptions of incivility and crime. In the course of writing his book, he made many contacts in the police. 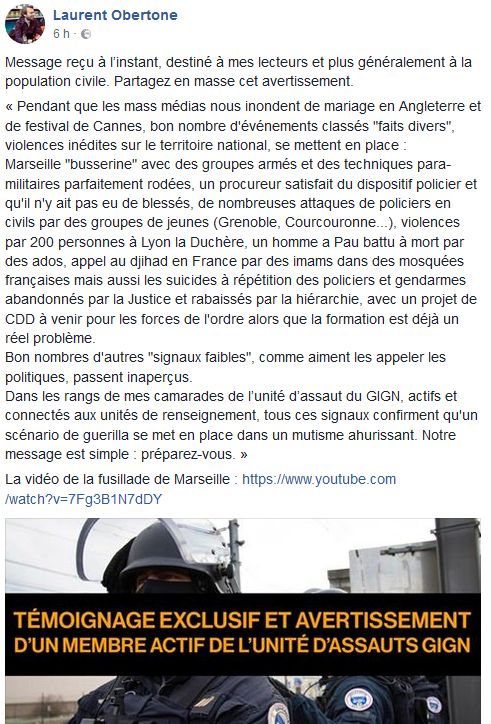 Here he relays a message he received from an anonymous member of the GIGN (police special forces units). Emmanuel Macron and his mother, Francoise Noguès, a Jewess of Portuguese origin. ‘French’ President Emmanuel Macron has said that President Bashar al-Assad needs to be ‘overthrown’ in order to build a “new Syria” that will fit into the new world order. The Rothschild sponsored President spoke to Fox News on Sunday saying that France and its allies “would have to build a new Syria after the war,” adding that the US role would be “very important” in the process. Macron went on to say that foreign states should “remain in Syria” because of the “threat” of Iran and Syrian President Bashar Assad. On Sunday, marchers in the trade union organized event descended on the Bastille to show their opposition to the changes. Thousands of people flooded the streets of France to demonstrate against President Emmanuel Macron’s economic reforms. “In the name of the poor, the humiliated, the homeless and the jobless, we are telling you, ‘Enough, enough of this world,'” leader of the far-left Defiant France party leader, Jean-Luc Melenchon, said. On Sunday, marchers in the trade union-organizedevent descended on the Bastille to show their opposition to the changes. Protests were held across 160 locations in cities including Paris, Marseille and Nantes. Macron says his economic changes are meant to increase France’s global competitiveness, adding that the protests will not block the country. French Interior Minister Gerard Collomb accused the protesters, and by extension the unions, of being “passive complicity” with people who have smashed shops and banks and set fire to cars during demonstrations. “What is astonishing is that the black blocs can do what they are doing in the middle of a crowd that, at the end of the day, does nothing. 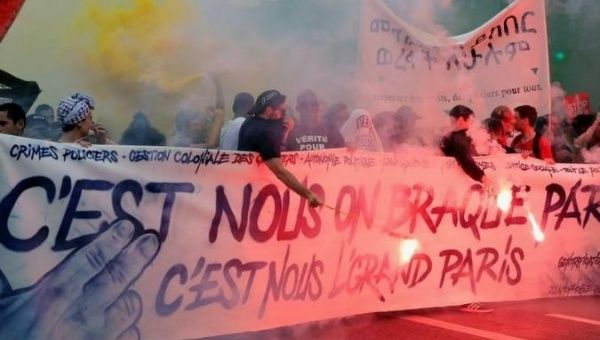 If we want to have the right to demonstrate, those taking part must oppose those smashing things up and not, by their passiveness, be accomplices to what is happening from a certain point of view,” Collomb said. French train drivers have been protesting the Macron government reforms for the past three months. In recent demonstrations, Air France staff, students and other workers have joined the drivers. Some 26 of 43 people who were arrested in Paris, remain detained on charges including suspicion of planning vandalism or weapons possession. Police estimated that 21,000 people took part in the Paris protest, while unions put the number at 80,000. More than 1,500 police officers were dispatched in Paris.